Tare your handle on the scales. 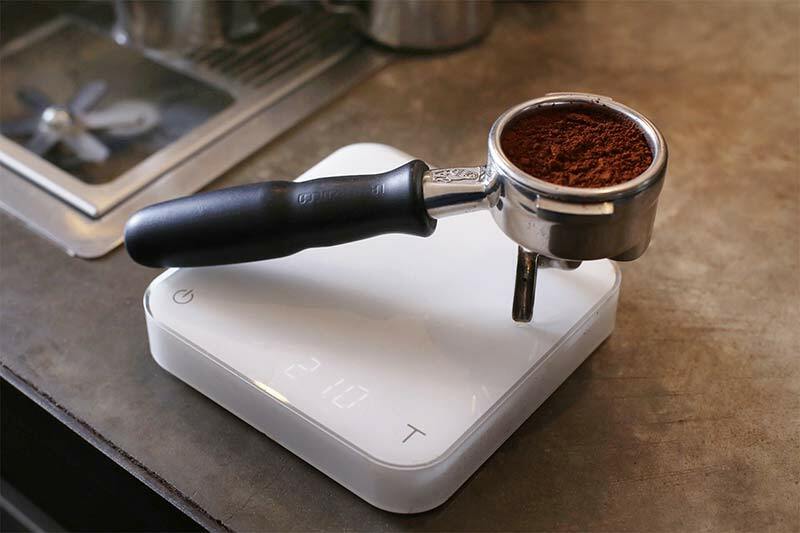 Grind your coffee into the basket (duh!). It doesn’t hurt during this stage to rotate the handle on the forks to start off the distribution process. A light vertical collapse (up and down tap) during this stage can help settle the coffee in the basket. Plop your handle back on the scales and check yo’ dose. Adjust if needed. Pick the handle up & use your hand to gently tap the side of the basket. Use your noggin’ to tilt it in the direction of the gaps, aiming for a nice even surface. This will knock the coffee round and fill any holes. Don’t stress – this may take you a while to get the hang of but will be well worth it. Tamp! Again, try to get surface perfectly even. Make sure that once you’ve tamped there’s no more bumping – from here on in we want to treat that puck reeeeeaaaaal gentle like. Gently insert your portafilter into the machine – smashing it ‘round will crack the puck and undo all of the evenness that we’ve been working toward. For more info on what happens see September’s barista tip on channelling. This method may be a bit different to what you’re used to, but the advantages are pretty massive. For starters, those of you who are used to grooming with your finger (often called the stockfleth method) will know all too well the havoc that the coffee oils will wreak on your poor finger. Finger grooming also, at its worst, will press in inconsistencies as you smush the coffee down, and at its best will only affect the top layer of the puck, doing nothing for inconsistencies below. So, please enjoy evenly distributed tasty extractions, do your best to avoid the awkward night club guy and get your bump and grind on responsibly.